I did not know him personally but serving as a chaplain with the local Sheriffs Office he was part of our family. The sadness was heavy, the grief of the family and friends was deep. In moments like these we search for meaning, for something that helps us bear the sorrow. God is always faithful to provide comfort if not understanding and sometimes does so in unexpected ways. I was catching up on emails and came across this excerpt from Jack Deeres book “Even In Our Darkness”. If you have recently experienced the loss of a loved one or know someone who has, I hope this speaks to you and if needed that you would pass it on. People often ask me “How do you find God in the dark times?” I always reply, “The dark days are not my problem. The good days are my problem. Those are the days when I tend to forget God, when I enjoy the gifts more than the Giver.” The dark days call me back to God and to his Scripture. The darkest days for the followers of Jesus were the three days after the crucifixion. On Sunday, two of them were walking to Emmaus, when the Risen Lord joined them, but they were prevented from recognizing him. “Why are you so sad?” he asked. The root of their sadness was that they had lost their confidence in Jesus to do what he said he would do. This loss of confidence in the promises of Jesus lies in the depths of most of my darkness as well. That’s what I would have done. It’s not what Jesus did. Instead of revealing himself to their eyes, he revealed himself to their hearts through Scripture. The greatest sermon ever preached was preached on the Sunday following the crucifixion. The preacher was the Son of God. The subject was the Son of God. The text was the whole Old Testament. The sermon lasted all day. The audience consisted of two followers of Jesus who had lost their confidence in Jesus to fulfill his promises. At the end of the day, they asked the Preacher to stay for dinner. He did. Then the guest became the host. When he gave thanks and broke the bread, these two broken followers recognized their Risen Lord and he vanished from their sight. Then they uttered the single sentence that for two thousand years has become the light for countless despairing followers of the Lord to find their way out of the darkness back to him. They said, “Were not our hearts burning within us while he talked with us on the road and opened the Scriptures to us” (Luke 24:32). They did not say “while we talked about him,” but “while he talked to us.” That Sunday on the road to Emmaus, Jesus taught all of us who would be his followers that the primary way he would speak directly to our hearts was through the Scripture. This story is his promise to do that on our good days and on our bad days. I thought that the darkest day I would ever experience was the day I found my son dead in his bedroom from a self-inflicted gunshot on December 27, 2000. Nine years later, on a September morning, I woke up engulfed by a greater darkness. That darkness mocked me. Soon others would join in. I thought of putting my gun to my temple to escape what was coming. “Help,” I said to the God I could not feel. A single verse of Scripture flashed into my mind. “Wait” means the Lord is coming. A single verse of Scripture gave this weak heart strength to wait. The Lord came. And I am still here. 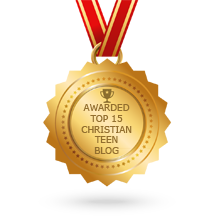 This entry was posted in CHRISTIAN NUGGETS, Christian Teens Blog JF, CHRISTIAN TEENS BLOGS, Christian Teens Blogs - He is my Peace, Christian Teens Blogs - He is my Peace, Light and Refuge, SHARING STRUGGLES, TAPESTRY TREASURES and tagged death, hope, life, suicide. Bookmark the permalink.